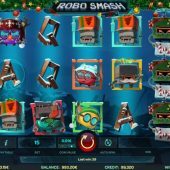 Robo Smash slot is a strange affair in that somehow iSoftBet have managed to cross-theme Christmas and Robots in the same game! It is quite a strange feeling to be spinning Robot symbols about and hearing soothing Christmas music over the top... However, I am for ever going on about the lack of imagination in modern slots, so they are already off to a good start in my opinion. Should you land the Purple Wild Robot on reel 1 in the centre at the same time you land the Green Robot Wild in the centre of reel 5 both will expand as per normal but this event will also trigger a Robot Battle. Any wins will be paid then you will get a series of 5 free games. The first will spin the centre 3 reels with the Wild reels 1 and 5 held. The second spin sees the Robot Wild reels move to cover reels 2 and 4 and any wins are doubled. The third spin has them meet on reel three where they battle, turn to skulls and then reels 1, 2, 4 and 5 spin and any wins are awarded a 3x multiplier. The fourth spin is the same as the second with them on reels 2 and 4 and the final fifth spin sees them opposite where they started on reels 1 and 5. Eagle-eyed players will notice that this feature is similar to the random Wild reels in-play on Netent's Guns N Roses slot. Robo Smash slot is slightly odd, but at least it's original. With a RTP of over 95% and a good feature frequency it's quite entertaining but some may find the frequent small wins tedious. There is potential in the Bonus Battle for hits of hundreds times your stake but I doubt the cheerful Christmas music will be accompanied by any pricey presents. I may forget to put the batteries in this Robot..